For many, Fall means hanging up the swim fins until warmer months next Spring. Sure, you can always take a vacation, but even that leaves an awful long surface interval before the snow melts. With that in mind, let me offer a few tips for making year-round diving not only possible, but fun. 1. Embrace the season. Depending on where you live, the falling temperature usually comes with much better visibility. Forget about the cold for a moment. I am fortunate to be able to dive with people from all over the country–sometimes the world. Very few have a body of water like Lake Tahoe in their back yard, let alone tropical reef systems, so enduring visibility measured in inches is pretty standard. Over the Winter, algae takes a break, and the green muck you’re used to goes along with it. If you can stay warm, you’ll actually begin looking forward to Winter diving’s great visibility and changing aquatic life. 2. Get a drysuit. If you think about it, the coldest water temperature you could possibly encounter is just above 32 degrees. Dressing for that temperature out of the water is easy. You just bundle up and head outside. A drysuit makes it easy to dress appropriately for any diving conditions. Drysuits today are available with nearly infinite options, from changeable seals, dry gloves and hoods, different materials, zipper location, you name it. And, when you consider the longevity of the suit (I have over 1200 dives in my DUI CF200 and it still looks new! ), the cost of ownership is much lower than diving wet. Most important, you’ll want to dive all the time, and enjoy your dives much more. A major side benefit to a drysuit is not having to change out of a wet wetsuit in freezing temperatures. You’ll gaze smugly at the rabble of shivering masses and casually stow you gear for the next day’s dives. 3. Take an Ice Diving class. Yep, Ice diving. You’ll not only open the winter months to some truly spectacular diving opportunities, but you will meet like-minded divers and become a much better diver through the additional training. 4. Take any SCUBA class. Use the Winter months to take some diving specialty courses (like PADI Drysuit Diver) and expand your skills prior to warmer weather. 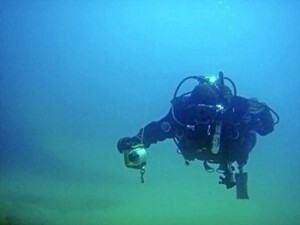 If you are interested in technical diving, train now and you’ll be ready for the depths come Spring. Your options are virtually limitless, and you’ll meet new diving buddies who share your interest underwater. 5. Take a diving vacation. As exciting as Winter diving can be, getting away to a warm, tropical island is just the ticket to staying motivated through cold season. Sure, getting out of the cold isn’t exactly a cold water diving “tip,” but that mid-Winter break goes a long way toward keeping us excited about our next trip under the water. The most important thing is to stay safe and keep diving. Diving in cold water introduces a few variables you don’t experience in warm water, but staying comfortable is a lot easier than you might think. So, don’t hibernate. Get out there and dive! This entry was posted in Diving Safety, SCUBA Instruction and tagged cold water diving, diving safety, drysuit diving.